NEW AND IMPROVED: Turn your iPhone or iPod Touch into a field-tested global satellite tracker. The Satellite Flybys app now works in all countries. "Seeing this lightning crackle among the exploding lava and ash was the experience of a lifetime," says Olivier Vandeginste, who took the picture on April 18th from Hvolsvollur, Iceland. 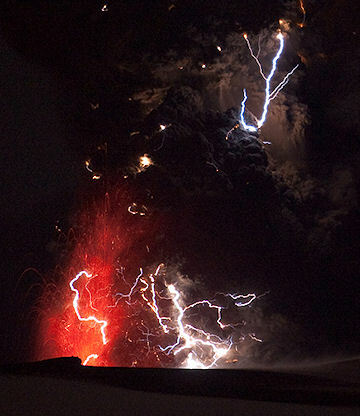 It is well known that volcanoes produce lightning, but scientists aren't sure why. The underlying mechanism is likely to be some form of triboelectric charging--that is, things bumping or rubbing together (like socks rubbing on carpet) to create a build-up of static electricity. That's how it works in sand storms and even ordinary thunderstorms. In a volcano, the "rubbing things" may be bits of ash and droplets of lava, although no one is certain. To investigate, a team of researchers from New Mexico Tech has arrived in Iceland to study the phenomenon. Photography is not their primary method, however. Cameras are limited to what they can see through the heavy clouds of ash. Radio receivers can do a better job. Lightning emits impulsive radio bursts which can be measured and counted, day or night, even through clouds of ash. "We are deploying a six-station lightning mapping array around the Eyjafjallajokull volcano," says team member Harald Edens. 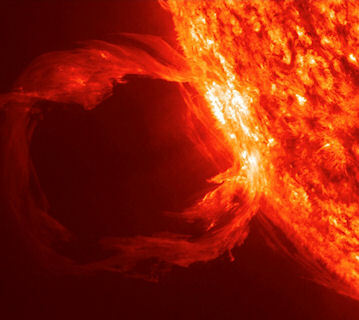 Their analysis of the radio "crackles" could reveal much about the inner workings of volcanic lightning. On April 21, 2010 there were 1116 potentially hazardous asteroids.